In Morocco, beets are regularly used in salads because they are available year-round there. A good friend of mine, who I consider to be an amazing cook, and who is also of Moroccan heritage, once served this beet salad at a dinner she had invited us to. It was so divine, I simply had to find out the recipe and then how to make it Weight Watchers friendly. Because this salad is composed primarily of beets, it’s already light and low in points. I just made a few alterations to it without sacrificing any of the delicious flavors. The cumin, cilantro, garlic and lemon give this salad the classic Moroccan flavors and are bright and refreshing. Don’t be put off by the fact that the beets have to be roasted before you can make the salad. And don’t be tempted to take a short cut and just get a can of beets to use. Trust me, the time it takes to roast the beets is well worth it. The roasting process gives the beets a beautiful, rich flavor. Just like with carrots and brussel sprouts, roasting the beets lightens the deep, earthy flavor that is often found in beets. Once they’re roasted, their natural sweetness comes out. Beets have long been a superfood. They’re naturally sweet and are often used to make refined sugar to replace the cane sugar that is frequently used in products. They’re rich in potassium, manganese, vitamin C and fiber. With the rich color of the beet, there’s a great source of antioxidants. It seems that, unlike a lot of superfoods today, beets were one of the “original” super foods. Beets were consumed in ancient times and may have been cultivated as long as 4,000 years ago in the Mediterranean region. They’ve long been used in these regions due both to their availability and their incredible wealth of nutrients. Early studies of the nutritional properties of beets have indicated that due to their high levels of nitrates, they can help to lower blood pressure. Beets can also help heal liver diseases and prevent anemia. Beets are often available year-round, but they are still a seasonal vegetable. They are typically in peak season in the fall and winter. Look for beets that are smaller (about 2-inches in diameter) to medium. Avoid the very large beets, as they tend to be woodier. I think one of my favorite parts of the salad is the fact that it’s so low in points. Because of the high fiber content of beets, they’re a very low point food. That means that unless you go overboard with the seasoning, you’re in good shape to indulge in this delicious side dish. The deep purple color of the beets is a perfect way to bring color to your meal. In fact, if you really want to mix it up, find a couple of different varieties of beets – the classic red/purple and a yellow, for example – and make the salad with more than one color. You’ll love this delicious salad. It’s healthy and low in points for a generous serving. It’s the perfect way to add color, flavor and lots of nutrients to your meal. Naturally sweet and healthy, these roasted beets are tossed with traditional Moroccan flavors to create a simple yet delicious salad that complements a variety of meals. Preheat oven to 425 degrees. Wrap beets in aluminum foil, and place in baking dish. Roast beets in oven for about 35-45 minutes, or until tender and can be pierced easily with a fork. Remove, and let cool. When cool enough to touch, remove skins from beets by rubbing gently with a paper towel. Dice the skinned beets and place in a medium sized bowl. Add in remaining ingredients, and toss well to combine. Serve at room temperature or cold. is there a chart or something. 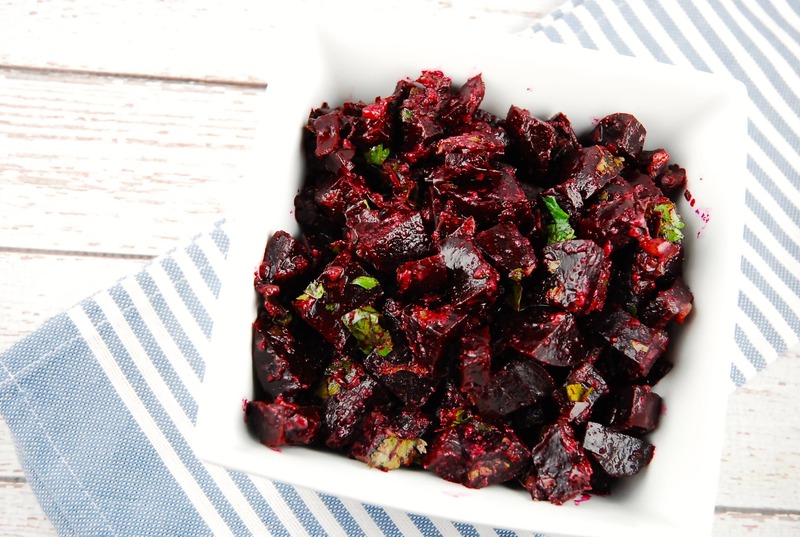 I adore beets, so when I saw this recipe in my in box today, I immediately made it. It is absolutely deeelicious!! Thank you!! You might be off on your Nutritional info for the Beet Salad. I checked and the calorie count for a 1/2 cup of cooked beets (plain) is 37 calories and the carbs are 8 grams with 7 of those grams as sugar. So, 0 g. carbs is not accurate, let alone a 1 cup serving would be 16 grams carbs!!! Not a good miss for a diabetic. Cindy, you’re absolutely right! But because my recipes are focused on the WW plan, I only calculate the nutritional info of ingredients that would have a Smart Points value. So the nutritional info that you are seeing for this beet recipe is really only the nutritional info for the olive oil, since the other ingredients are all 0 Points on the Weight Watchers plan. This would be the only info that actually needs to be entered into the WW calculator in order to find the Smart Points value. Since the other ingredients are all 0 Points, if I included them in the nutritional value, then once that data is entered into the WW calculator, it would end up giving a higher Smart Points value, which would be inaccurate. Confusing – I know. Sorry for that! Add a little goat cheese and bacon for low point meal. I thought I hated beets, but that was before I tried them roasted. Delish! Bacon and goat cheese!??!??! BRILLIANT!!! And I love you.